Like in most metropolitan cities, fresh vegetables and fruits are rare gems to find, and a real pleasure to encounter in Hong Kong. And unlike Czechs (see Camilla’s post on Naplavka Farmers’ Market in Prague), Hong Kong people are far from outdoorsy. So when a friend invited me to a farm visit, I was more than delighted to join. After an hour long bus ride, we arrived at Zen Organic Farm, one of the largest in Hong Kong with the most variety of heirloom vegetables. Heirloom’s definition has been debated over the years, and for Zen Farm, they take pride in their products being cultivated from a single family of plants to another, for many generations. Compared to commercially bred vegetables, heirloom ones are juicier, more flavorful and more nutritious. However, their skin is also thinner which makes them more perishable, which is one of the reasons why heirloom produce is increasingly rare in the commercial agricultural industry and in supermarkets. Nowadays many plants are cross-bred in order to boost farming yields, disease resistance and improving consistency for transportation. Led by a Todd Darling, founder of Homegrown Foods, a home delivery service that sources sustainable local produce, the farm visit started off with a tour around the greenhouse. Todd gave us an overview of the heirloom vegetables and a background of the farm. 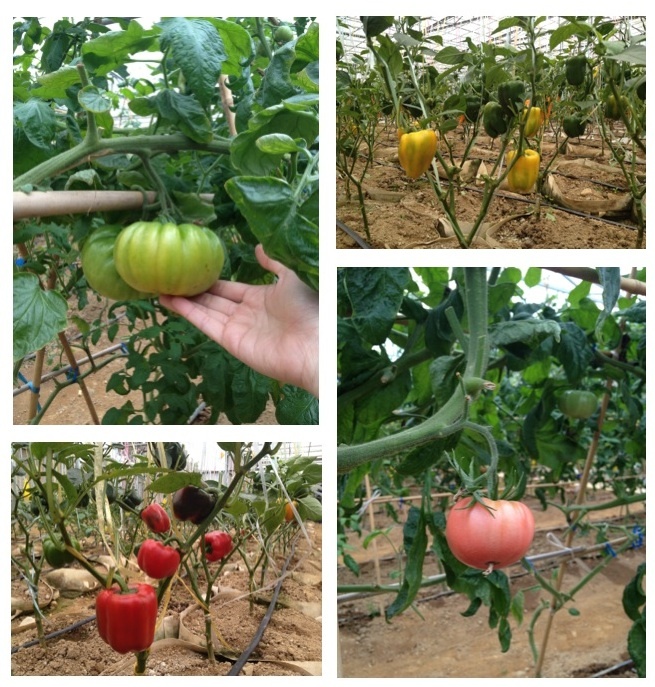 It was delightful to wander through rows and rows of tomatos, cherry tomatos, red/yellow/green peppers! Looking was not enough; I was so tempted to pick out those fat tomatoes and beautifully colored peppers in the greenhouse. Luckily, we were soon brought to the store where the vegetables and fruits were nicely laid out. The highlight of the day, though, was the action; for the kids, picking strawberries, and for everyone, picking carrots! Pulling the leaves without breaking the connection with root is a skill in itself. 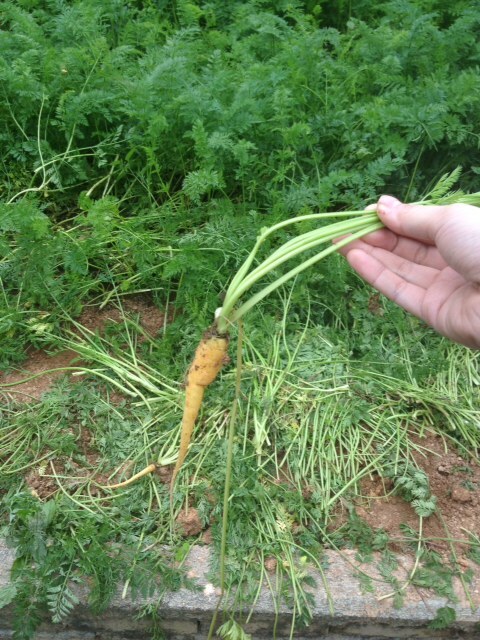 After a few fault attempts, the moment of pulling a full carrot was exhilarating. In the end, everyone was happy to carry home a few fresh-off-the-farm carrots. 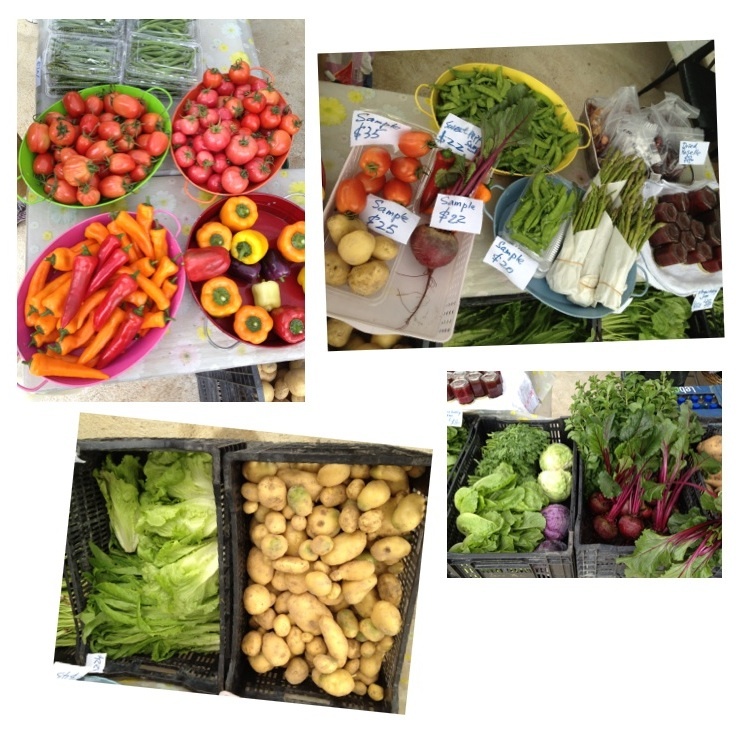 Visiting a farm reminds me of the beauty of fresh vegetables. Connecting with the nature amidst a busy city life takes quite some effort, however it is usually highly rewarding and renewing to the mind and body. This entry was posted in Do, Hong Kong and tagged do, explore, michelle. How cool! So, did you eat your carrot? Did you feel like there was a flavor difference between your carrot and the carrots that you’re able to buy from commercial shops? I’m glad HK is trending towards agri-consciousness. I wonder, are HKers, like NYers, doing any container planting themselves on their terraces or roofs? Hey Kate, Yes I did eat the carrots for dinner that night :) Fresh and yummy! Re-container planting, that’s actually one of the projects I’d love to do in HK! There are so many skyscrapers in HK and wasted space on the rooftop. If you know anyone who started these initiatives in NY, I’d love to talk to them and learn more about how they started it!